Senior managers spend up to 23 hours a week in meetings – keep their attention with these top 10 tips for an effective and strategic business review meeting. According to a 1998 U.S. study, the average employee spends 6 hours every week in meetings, and senior managers attend nearly 23 hours. Yes, every week! So it’s no surprise they have a reputation for being boring and unproductive. Read on for my top tips to whip your meetings into shape and have your clients clamouring for their business review. What is a business review meeting all about anyway? It ensures alignment and creates a shared perspective. By that, I mean clarity (what’s done, what problems need to be solved and who’s doing what) and trust (ideas, learning, commitment and accountability). 1. Get it in the diary. Now. You’re already at a disadvantage if your reviews for the next 12 months are not already in the diary. Why? Your clients’ diary is likely to be empty so you’ll generally get the date of your choice. The more advance notice, the more chance you’ll get an appointment. If it’s January and you ask to meet in June, how can they refuse? If you’re asking to meet next week, chances are they might not be able to squeeze you in. The reviews will actually happen! Deliver business reviews promptly – and set your meetings within 4 to 6 weeks of the period end. Who wants to discuss performance for January to March in July? Not me. Allow enough time. 90 minutes at most. No longer. It can be tough to hold people’s attention at the best of times. Make sure your client books a room, not just time on their calendar. I’ve delivered plenty of reviews in coffee shops and lobbies and it’s not fun. Request the largest room available, so you’re confident you have room for everyone if the number of participants expands. Why not invite your client to visit your office? It’s a great chance to host the review with a behind-the-scenes visit and meet the teams that support them day-to-day. Get those reviews in the diary for the rest of the year and don’t forget to book the meeting room. What are you interested in exploring during the business review? What are your goals? What targets do you have as an individual and as a business? Has anything changed about your role? Do you have different priorities? What are some of the big projects you are working on? You may already know some of this, but re-confirm. Things might be different since you last met. Focus on measurable criteria that cover key elements such as cost, quality and compliance. A business review meeting is about strategy. The purpose is to propel the program forward in a meaningful way. It is not the time to explore day-to-day issues or rehash the past (but more on that later). It’s also not the time to be learning about unexpected trends for the first time. You don’t want to appear unprepared. Your client doesn’t want to be surprised either, especially in front of the boss. 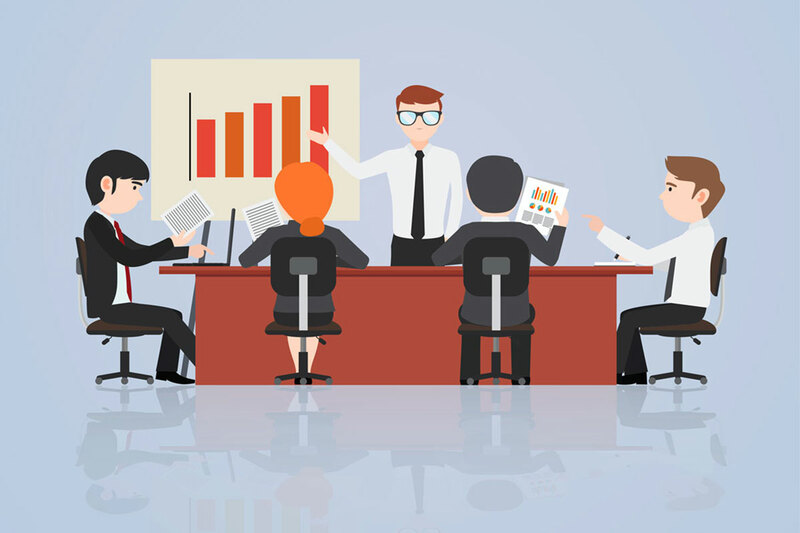 A pre-meeting is vital to get aligned and deliver a successful review. It helps you gather information, identifies objections, builds support and refines your approach. By the time of the actual meeting, your review will be cohesive and respond to the needs of your client. A short planning call with your client means a focused review with insights important to them. Don’t do it alone. Don’t have a cast of thousands either. Invite stakeholders familiar with the program and who can make a valuable contribution. Gather decision makers and strategic influencers. You’ll have a meaningful discussion on program outcomes and priorities. It’s also efficient. You’ll gain agreement on tactics and identify (and overcome) obstacles before ending the meeting. Without the right people, you won’t leave the meeting with anything other than homework. You want decisions! You want action! Don’t keep participants any longer than you have to. If they only need to be their 30 minutes, then relieve them of any commitment to stay for the duration. You will get better attendance, more engagement and a great reputation as a meeting host. Send reminders the day before, or the morning of. Let your stakeholders know how much you’re looking forward to their participation and how important their feedback is to the development of the program (translation: make them feel guilty). During the meeting be on the look out for quiet voices. Not everyone is quick with their opinion – so encourage them to share their feedback. The right participants will fast-track your program objectives. “Business Review” is not an agenda. If you’ve followed Tip #2 then you’re already clear on what you want to discuss and why. Get these into an agenda, but be discerning: not every topic can make the short list. Focus on two or three primary drivers most impactful to your client – and which you have a chance of influencing. Keep a note of those other great ideas for next time. Choose topics of interest to the wider team. Interdependent issues will drive engagement during the meeting. You don’t want people tuning out and regretting accepting. Circulate the agenda and the business review a few days in advance and encourage feedback so you can fine-tune it. Assign topics if needed and make it clear to everyone the preparation required. You’ll know the when, where and how, but only your client is going to know the why. It could reveal vital information that will influence how you approach the program. During the agenda do not introduce new topics spontaneously. Give some context – why is this topic on the agenda? This is particularly effective if you have an issue not immediately apparent why it’s for discussion. Allow time to gather feedback from participants on their thoughts about the meeting (what went well, what could be improved). A word of advice: get your clients’ sign off on the agenda before circulating. Just in case. So this can be tough, especially when you’re the supplier, and you are telling the client to get off their phone. For an effective meeting, everyone must be present – in mind and body. When participants are on their laptops or phones it is frustrating, distracting and quite frankly, rude. In your agenda let everyone know you’ll need you’ll need their full attention and to please refrain from using devices. every 30-45 minutes – between topics on the agenda. of the meeting while they attend to the email or call. If it’s important enough, they’ll do just that and save everyone else from being distracted. Most likely, it isn’t and they’ll just put the phone down sheepishly after being busted for breaking the rules. Is your business review meeting boring? Keep them apart is all I can say. Now don’t get me wrong, how you interact with your client and fulfill your products and services are very important. Discussions often reveal underlying issues that are part of a wider problem that may impact profitability and retention. However, you only have 90 minutes to present the last quarter, agree on priorities for the next and the tactics to get there. A conversation about why someone was on hold for 20 minutes, or why their delivery was a few hours late could hijack your entire meeting. Don’t sweep operational matters under the carpet. They need your attention. Just not during the review. Set up another meeting for that purpose. For efficiency, I recommend before the review. You’re already on-site, so it saves you a trip and the time will be controlled better as you’ll have a hard-stop for the review. It also means you’re leaving on a positive note after a thoughtful and interactive strategic meeting in which you spoke of all the great things about your clients’ program, not all the problems. If you’ve not made scheduled it, don’t get persuaded for an impromptu session. You’ll be unprepared and also have no idea of how long it’ll last. I’ve been tempted with the promise of a quick pit stop by someone’s desk only to find 2 hours later I’m still there after word has spread that I’m around. Stick to strategy. Set up a separate meeting to discuss operational matters. You want to learn from history, not re-live it. Don’t get distracted during your meeting dredging up old issues. What you learned from them, and what you’re doing about it are the emphases. The Business Review is about making major decisions to move the program into the next quarter, so spend most of your time forward focused and discussing the opportunities. Make sure you have some great examples to share about how your key contact has supported the program. Everyone loves recognition and they’re no different. It also adds to their credibility which in turn helps them get stuff done. Don’t keep the good news to yourself. Share it. This is what will drive your program forward. Embrace continuous improvement opportunities and spend time on devising strategies that address them. Think innovation – explore new ways to solve old problems. 10. So what, what now? Don’t just make statements. Build the story, capture the imagination. Inspire your client. Make things happen. Just know why you need to do them and how. Stick it to your laptop. Your monitor. Your bathroom mirror. These aren’t just words for business, but tools for life. They’re questions I ask myself every day about lots of things. Then you are ready to implement your plan. Make sure you factor in regular reviews and keep you plan agile enough to respond to a changing environment. Be flexible and adapt if you need to. Like any forecasting, you might have got it wrong. Better to admit it earlier and adjust accordingly, than risk non-achievement and a lot of disappointment. Just ask yourself: So what? What now? All will be revealed. Who knew meetings were such a complex topic? Harvard Business Review has an entire portal dedicated to the subject. Hundreds of articles: from quick tips to in-depth research – all to help you be more effective in meetings. I highly recommend this read, some very practical tips on agenda setting. 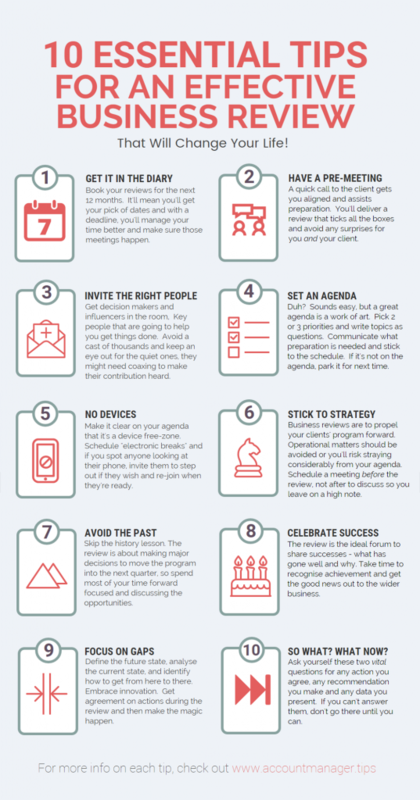 Make every last minute of your meeting count with 7 actionable (and detailed) steps. A must read. Some incredible (and polite) tips for a device free meeting. I’ve shared some of her advice in this article. I also follow Kristi on Twitter, I highly recommend you do the same. Should you even be running your own meetings? Paul tells you why it’s time to hand over the reigns. I love this article. Inspired by improv, Emilia shares 4 ways you can encourage participation in your meetings.